Well, the couple of wet and windy days are forgotten already. 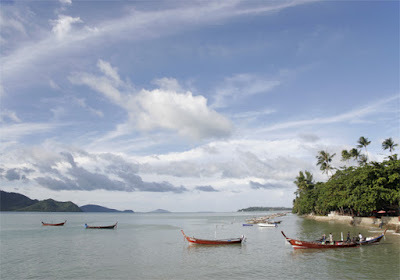 We've had great weather in Phuket the last 2 days, sunny and hot, just like it should be in the low season! I mean, come on.. if you have been in Phuket this month, you've had sun, sun, sun, sun, sun, sun, sun, rain, cloud, sun, sun sun. Right? Weather cleared up nicely for some diving over the last couple of days. This morning I stopped off at Chalong Jetty to say hello to people going out diving and to take a couple of photos. The view below (looking south) has not changed in 10 years except to take the photo I am standing on a modern jetty rather than a rickety wooden one. I have always liked this view. 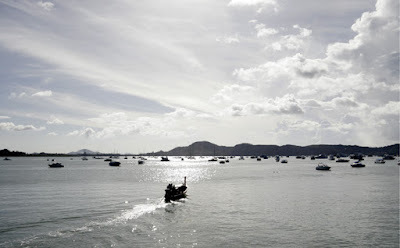 Longtail boats, offshore islands. The island on the horizon (about 20km from Chalong) is Koh Racha Yai, where I must have dived 100 times. There will be a beach clean up on July 2nd. If you are in Phuket, join in! This is part of an ongoing effort to clean up the beaches in the summer. The prevailing west winds blow all kinds of flotsam and jetsam onto Phuket's beaches. It can look messy. I plan to be at Karon Beach for the clean up.